Posted on Fri, Sep 4, 2009 : 5:10 a.m.
Well, it’s been an exciting couple of months for longtime fans of The Rationals, and for the former members of the legendary Ann Arbor group itself. Especially for Rationals’ singer/frontman Scott Morgan. In July, after many years of wrangling over licensing issues, the Big Beat record label released “Think Rational!,” an exhilarating, two-CD anthology that captures the first, mid-1960s phase of the Rationals’ short but significant career. Significant, because the Rationals’ intense, high-energy mix of British Invasion buoyancy and scrappy rocking-soul was a big influence on the generation of bands that followed. And Morgan is still regarded as Michigan’s most expressive rock singer of the mid-to-late-‘60s. One could even make the case that The Rationals’ mid-‘60s garage-rock/garage-soul (even though those terms hadn’t yet come into vogue) were a big inspiration for the Stooges, the MC5 and the Bob Seger System (and, later, Seger and the Silver Bullet Band) — local acts that went on to enjoy national prominence that The Rationals never attained. That may be partly because the Rationals broke up in 1970, due to management issues and feuding within the group — whose members, by then, were still only 19 and 20 years old. Remember, this is a band that formed when the members were still in junior high, and had their first regional hit single when they were barely into high school. As expected, “Think Rational!” has attracted long-overdue national attention to, and praise for, this seminal Michigan group. Rock critics have thrown plenty of precious metal at the feet of “Think Rational!” — not just in Detroit-area papers, but also in national music mags and on rock websites. David Fricke, the grand poobah of Rolling Stone critics, featured it in his “Fricke’s Picks” section and raved about the band and music on this collection — which, believe it or not, is the first-ever Rationals anthology CD. And that’s pretty important for a band that only released one album in its career — and that one came in 1970, as the band was fragmenting. Big Beat plans to release another anthology next year covering the band’s ’68-’70 period. Reviving the “brand name” So, in the wake of the disc’s over-the-moon reception, Morgan decided to revive the Rationals’ “brand name” and start doing shows consisting entirely of the Rationals’ music. His first such outing was in late July at the Magic Bag in Ferndale, and he’s talking to other promoters and venues about more such shows in the future. However, for the Bag show, he was not joined by his original Rationals bandmates — guitarist Steve Correll, drummer Bill Figg and bassist Terry Trabandt — due to geography, timing and the fact that they’ve been out of the music business for many years, and either have other jobs or are retired. Morgan still lives in Ann Arbor, and has continued to be a mainstay of the local music scene in the 40 years since the Rationals broke up — leading bands like Powertrane, Scots Pirates, Dodge Main and The Solution, and being a key member of Sonic’s Rendezvous Band in the ‘70s, along with Fred “Sonic” Smith of the MC5. But Correll lives in the Upper Peninsula (he’s a retired woodworker/restorer for the University of Michigan), while Trabandt lives in South Florida and has a job driving a delivery truck. Figg is still local — he lives in Dexter — but is recently retired from being a full-time welding and fabrication instructor at Washtenaw Community College. So, for the Bag show, instead of bringing his old bandmates together, Morgan recruited players from other Detroit-area bands he knows from his years on the Detroit/Ann Arbor music scene: lead guitarist Matt Smith (from Outrageous Cherry and the Volebeats), bassist Jim Diamond (formerly of the Dirtbombs) rhythm guitarist Chris Taylor (Powertrane), and drummer Dave Shettler (SSM). The original members are talking about re-uniting for a possible European festival tour — which would probably be next year, when the second anthology is released, says Morgan. “Think Rational!” was first conceived “about 15 years ago,” relays Morgan, “when the record company started talking to Jeep [Holland, the band’s manager, producer and biggest booster during the first few years of their career]. “Jeep died not long after that, but the label was very persistent, and finally acquired the rights to all of our old songs (which were recorded on several different labels) from Jeep’s estate. Both of the Rationals’ stinging interpretations of Holland/Dozier/Holland’s “Leavin’ Here” are included. Of course, their local-hit version of Otis Redding’s “Respect” is front and center — as are many of Morgan’s fan-fave compositions, like “Feelin’ Lost.” “Someday” and “Sing” — plus a couple of engaging, never-released songs written by the whole band. 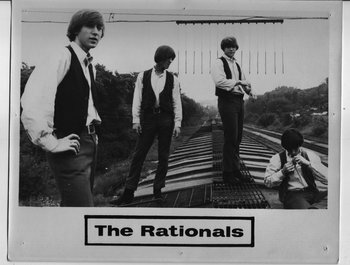 The Rationals’ initial inspirations weren’t too different from those of other young bands in the early to mid-‘60s: the Kinks, the Zombies, the Stones, the Beatles. Then they met Holland, who was a soul-music freak. “We obviously also dug Motown, because living here, we were surrounded by it, but Jeep’s the one who turned us on to the deeper soul, the Memphis-soul stuff, and the stuff that you wouldn’t hear on the radio,” says Morgan. And the Rationals performed them with such passion and exuberance that the songs just crackle out of the speakers — and also bolster their cred as the greatest “garage-soul” band of the period. Morgan has some fond memories of his other teen-years “encounters” with soul music. “One year, Steve’s mom drove us down to the Motortown Revue at the Fox Theater, which had all of these great Motown and soul artists, like Little Stevie Wonder. The crowd was going crazy, and it didn’t matter if you were black or white. Those shows were pretty intense. Then she’d drive down later and pick us up,” recalls Morgan. “The next year, we had our driver’s licenses, so we drove down ourselves, and on our way out, someone said that Marvin Gaye was going to be sitting in at this strip joint down the street — I think it was called The Empress. So we walked down there, and asked if we could come in and watch Marvin, but when they found out we were only 16, they said they had to walk us up to the second floor, via the fire escape, and told us we had to stay in the balcony. The Rationals’ legacy When it comes to weighing the Rationals’ legacy, Morgan is modest at first — but, when coaxed, he agrees that the Rationals were one of the most influential bands to ever come out of the Ann Arbor/Detroit area. “I think we were right behind Mitch Ryder and the Detroit Wheels, because they came before us, but I think we were next in line, in terms of playing” rocking-soul music — which Morgan amusingly refers to as “green-eyed soul, ”“because I have green eyes,” he says. And does he regret that the Rationals never transcended regional-hero status — that they never became a big-time national band? "Think Rational!" is available at Amazon.com and Ace Records. Kevin Ransom is a free-lance writer who covers music for AnnArbor.com. He can be reached at KevinRansom10@aol.com. 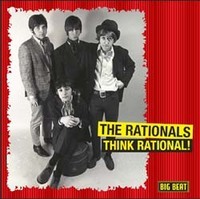 Top photo: "Think Rational" CD artwork. Lower photo: Photo courtesy Scott Morgan. From left: Scott Morgan, Bill Figg, Steve Correll, Terry Trabandt. Fri, Sep 4, 2009 : 3:39 p.m. I talked to Matt at Underground Sounds a week or so ago and he had the CD on order and is waiting for them to arrive. Fri, Sep 4, 2009 : 11:51 a.m.
Auntie, either Underground Sounds or Wazoo here in downtown A2 would special order this for you if they don't have it in stock. I know for sure that Underground gives a discount on special orders, though you may want to contact both stores. I included both stores' addresses and phone numbers at the end of Martin Bandyke's story about brick-and-mortar record stores. Fri, Sep 4, 2009 : 11:22 a.m.
Fri, Sep 4, 2009 : 11:17 a.m.
Auntie, I'm sure someone locally has it. I think most stores got it in initially, then it sold out, so they had to re-order. So, you could call your favorite area record stores to see if they got their second "batch" in by now. Fri, Sep 4, 2009 : 11:10 a.m. Does anybody know if the CD is available somewhere locally??? Fri, Sep 4, 2009 : 11:06 a.m.
Yeah, I do think that the Rationals' great music was, for many people, "lost in time" for a while, due to those singles never having been gathered together for an anthology like this -- and, of course, since they only released that one album, which didn't include those great mid-'60s singles. Hopefully this anthology will rectify that. And wouldnt it be great if someone dug up enough footage to put together a DVD of some of those Swingin Time appearances, and their other live performances of the era? Fri, Sep 4, 2009 : 9:48 a.m. I always loved the group's music. I lived in Monroe, MI and a lot of the local bands there covered The Rationals music. I remember watching them on Swingin' Time with Robin Seymore on TV and, as I recall, they got a lot of play on Detroit radio station CKLW. Fri, Sep 4, 2009 : 7:59 a.m.
Fri, Sep 4, 2009 : 7:57 a.m. It was a great era in Ann Arbor. Folks today won't ever know. And while we're at it, whatever happened to the "Aftermath" and their members? How about those Sundays at the West Park band shell?